Raychel and Dave flew over to Spain from Dublin to enjoy a nice break away after having recently got engaged. As they lay on the beach relaxing in the sun and staring out to the Mediterranean sea they suddenly realized that it would be a fabulous idea to get married in Spain. They began their search for their dream wedding venue in Spain and travelled both East and West of Malaga until they came across a perfect beachside hotel less than 10 minutes walk to the marina in Estepona. The views were outstanding with the Rock of Gibraltar and the Atlas Mountains of Morocco set in the background behind the glistening Mediterranean Sea. They specifically wanted a child friendly hotel and an area where there would be lots of amenities for their wedding group of friends and family who were travelling from Ireland and the USA. Choosing to have their wedding in Spain on the 4th of July provided a double celebration and catering for their American guests who would be in high spirits. 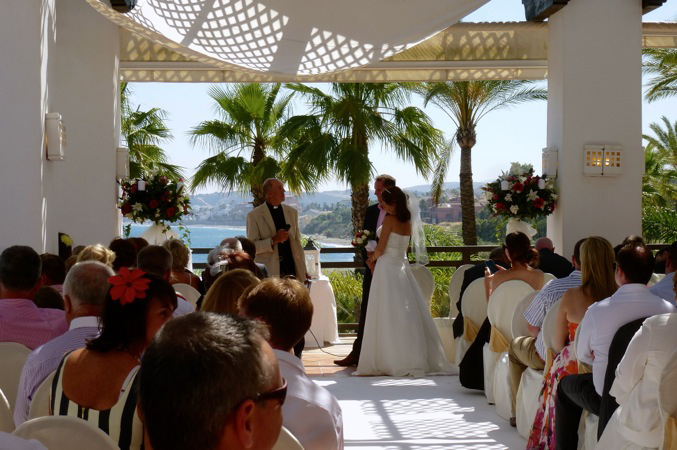 The wedding venue in Spain catered for their ceremony to be held on the upper terrace, which over looked the sea. Guests enjoying the service taken by Padre Peter, and the sounds of a live violinist and chelo player, who also provided entertainment playing a themed selection of Jazz music during the reception. As guests were called for dinner they were led downstairs where symbolic flags of the USA and Ireland were displayed making this Estepona Beach Wedding a real Independence Day celebration. The theme for this beach wedding in Estepona really was to party and the bridal couple made sure their wedding guests in Spain were truly entertained with Marbella’s finest pianist with support from Roberto on Saxophone who both performed live for hours as guests drank and partied. As darkness fell and all the other hotel guests were heading to bed this wedding in Spain truly came to life. Guests were led to the in house party room where a DJ performed into the early hours where a spread of late night food was enjoyed by all. As guests had flown from far and wide to their friends wedding in Spain, Raychel and Dave wanted to make sure they said a huge thank you to everyone, so the following day the Sunshine Weddings Spain team organised a BBQ feast at a local beach bay just 10 minutes walk from the hotel. The party started once more and in a relaxed fashion this amazing beach wedding in Estepona was the talk of all the guests as they ate and drunk and re-lived the memories of the night before. We wish Raychel and Dave every success in their future and enjoyed being part of their wedding in Spain.